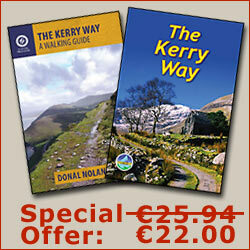 Many walkers opt to take a break from the Kerry Way and visit the Skellig Islands. The larger of the islands, Skellig Michael, is an UNESCO World Heritage Site that could be described as Ireland's Machu Picchu. 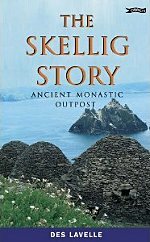 There is an early Christian monastic settlement built near the top of Skellig Michael upon sheer rock. This is reached by climbing 600 steps, which were painstakingly hand-carved by monks. Nearly 200m above sea-level is an enclave of six stone beehive-shaped huts and two boat-shaped oratories. Their architectural style suggest it was built sometime around the 6th Century. It was the belief at that time that the Skelligs looked out across the Atlantic Ocean towards the edge of the world. Des Lavelle, author of the Skellig Story, has taken thousands of visitors by boat out to these islands. 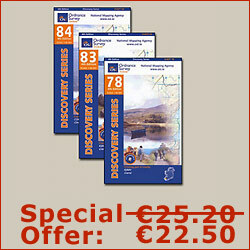 Indeed a whole chapter of this book is dedicated to the thrill of the journey by boat to reach the Skelligs. In addition to chapters covering the religious heritage of the Skelligs, Lavelle also delves into the more recent history of the lighthouse on the island. With one of the largest Gannet colonies in the world, the Skellig Story covers the many species of bird life, in addition to plant species and marine life. Perhaps one of the main sideshow attractions on the Skelligs are the colourful Puffins, which can be seen in the Summer months. The most popular places from which to arrange a return boat trip to the Skelligs are from Glenbeigh, Kells, Cahersiveen, Waterville and Caherdaniel. It is highly advised to book a place in advance. A helpful B&B owner should be more than willing to make arrangements on your behalf.